As the need for locally made products increases, so too is the desire to capture the spirit of an older America. At The Good Union, based in Carrollton, Texas, each product is inspired by the blue collar American worker and recaptures the desire and care for quality materials and craftsmanship. I can't help but love their hand-letterpress tees that are all individually hand stamped using 1940's vintage wood type blocks. Each one may vary slightly from the next in terms of coloring and spacing...fun. As The Good Union crew continues to expand their wares, I'm happy to see these next two items in their collection. The Woodsy hand soap has a clean ourdoorsy smell with a hint of musky wood. I want to try... Then the Industrial Stone Necklace is made from authentic Petoskey stone. See all their fine, American made, manly items here. 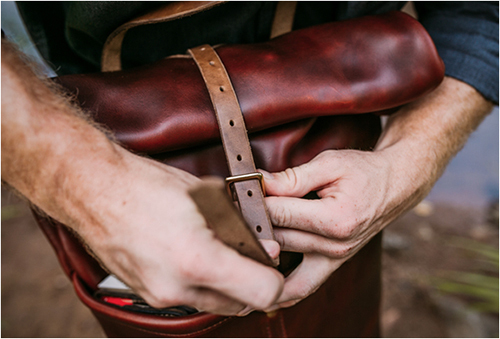 Ever since I first blogged about Michael Stricklin and his developing line of cool, rugged leather goods, handmade in Alabama, I've been an avid fan. It's always very rewarding to see the success of emerging artists who care so deeply about their craft. And the hard work is paying off. This leather rucksack, in my opinion, is his best work yet. Each Loyal Stricklin rucksack is made to order and has a lifetime guarantee. Made of the highest quality 4 ounce leather, each bag is 12" wide x 5" deep x 19" tall when rolled up. When unrolled, the bag extends to 25" in height. It's an investment piece that will stand the test of time, getting better with time- just like Michael's handiwork. 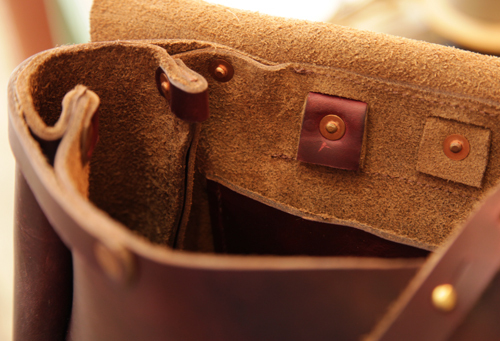 To see all his wares, which include wallets, belts and his popular aviator mug, click here. Dana Glaeser's roots are in the deep south where he was born and raised...until his life journey took him to NYC to work as a Marketing Executive. Left a tad unsatisfied in the corporate world, Dana decided to jump ship and work for himself- crafting something with his own two hands that stirred his soul. 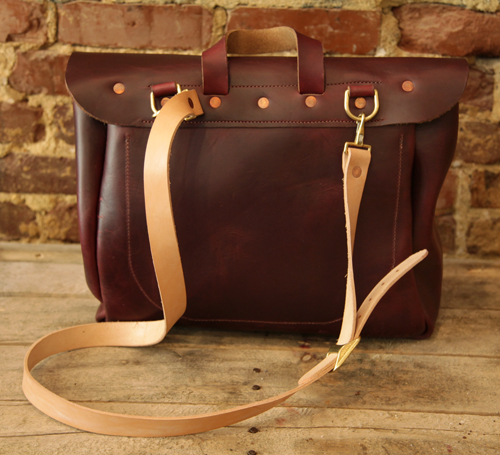 Like this crazy good Sheffield Bag, made with Horween leather and antique brass hardware. A while back, I visited Shaun Garcia at his home in Spartanburg, South Carolina. He's a Chef de Cuisine by day, master sewer by night, which is just one of the many reasons to love him. His expertly handcrafted mailbags are to be admired. I was reminded of this when he brought a few new bags to sell at our recent Sweet Peach Revival. 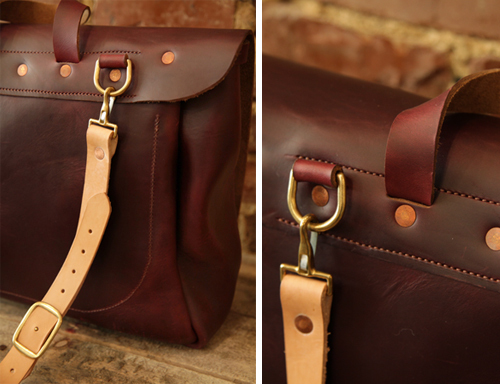 These stylish satchels are unique as they are 100% handcrafted by Shaun in his home. 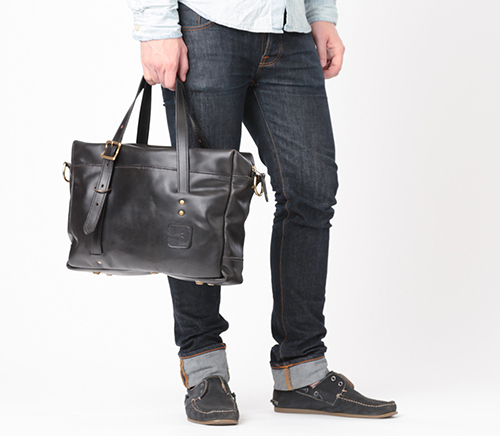 For each bag, he utilizes the highest quality Horween leather and materials. As a renowned chef, Shaun shared his take on it- "As a chef, I've decided to use the best ingredients to cook with, so I also use the best ingredients to craft with." There are approximately 23 copper rivets added to each mailbag. All are hand set, hand cut and pounded down by Shaun himself, using an old railroad tie as an anvil. This is how the original USPS mailbags were made, which inspired the entire look of his bags. Shaun, "If you want to make the bag last, you use these rivets." 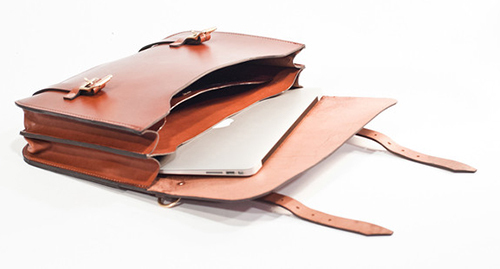 It's quickly evident by look and feel that these bags are built to last. In fact, each and every one has a lifetime guarantee. Shaun, "These bags are made to be passed down, generation to generation. It's like a black leather jacket, they're timeless in style." In early fall, Shaun is planning to handcraft 26 new bags, so they will be available for next day shipping via his Etsy shop. A few mailbags in his next run will feature Horween Derby leather, which is undyed and guaranteed to develop an individualized, natural patina with time. 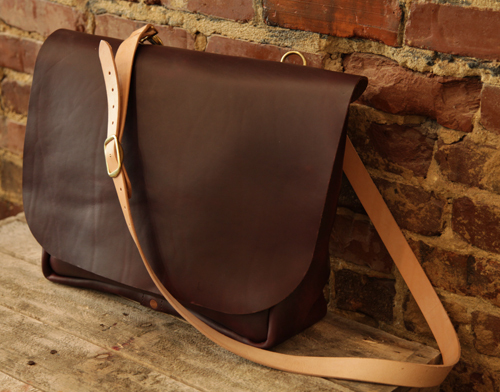 Learn more about Shaun's mailbags at his Etsy shop, or if you're in Atlanta, stop by Belly General Store to see a few of Shaun's beautifully made bags in person. Trust me when I say, you won't be disasppointed. Daniel Ralsky is a traveler. He's visited 25 countries so far and revels in the ability to explore various cultures and landscapes. And as any traveler would tell you, the right bag is invaluable on journeys far and wide. 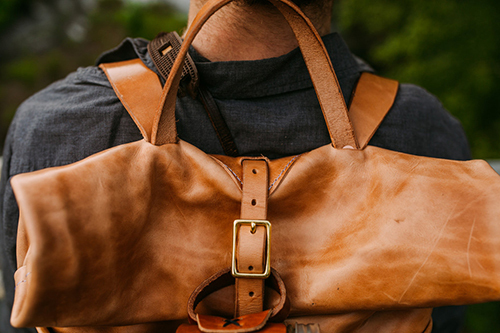 Seeing a need in the market, Daniel recently created a handsome bag line named Satchel Page that mixes function and a worn-in, rugged style, reminiscent of the 1940's. 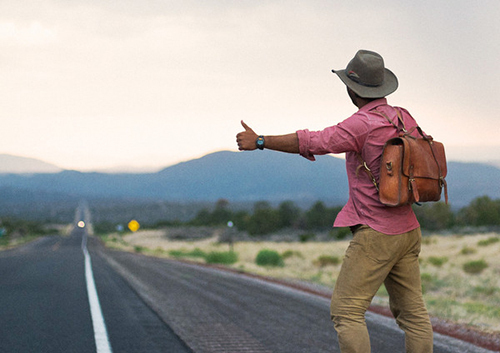 Daniel, "I set out to create something different; a line of durable, functional and stylish bags that expressed my passion for travel and the freedom that comes with it." What is especially nice to learn is that all the materials are sourced here in the USA, with all the leather coming from Texas. 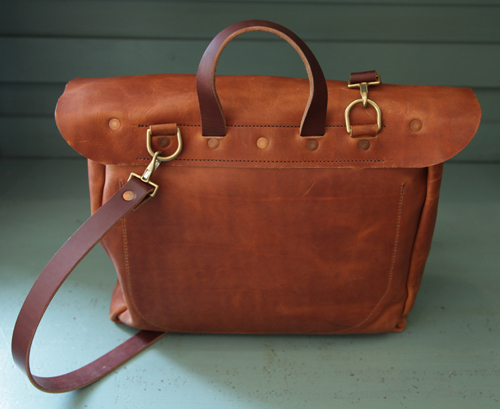 I particularly love this bag, inspired by Daniel's grandfather's map case from WWll. It looks and feels as if it was passed down from generations passed, but this modern day version has an interior compartment for an iPad and pocket for your phone. 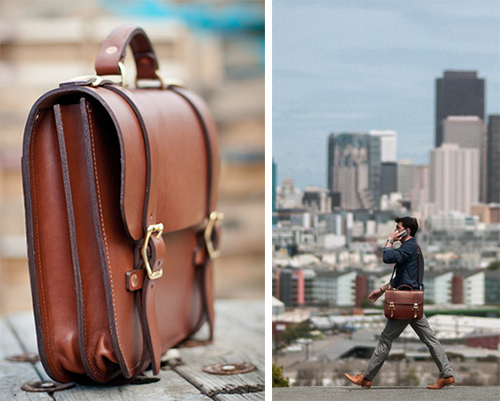 Daniel resides in Austin, Texas and offers five manly bags in his leather collection. 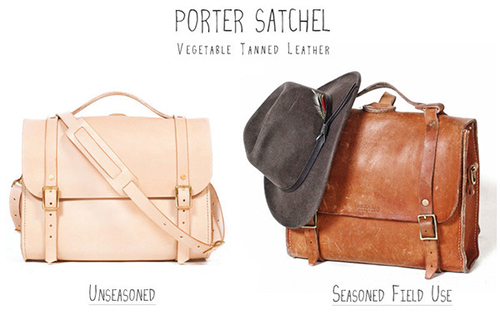 All are handmade with vegetable tanned leather, hand stitched seams and expert detailing. These are bags to be worn, used, passed on and used again. The patina will become more layered and nuanced with time, much like a traveler, wandering the globe, seeking memories to last a lifetime. A lover of the man bag, I was so happy to see one draped over almost every man's shoulder. 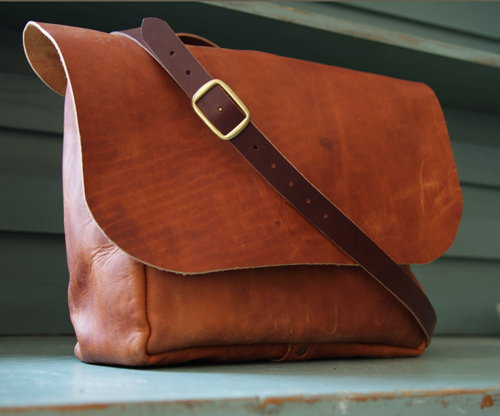 The bag, most often in leather, was always classic and simple. Per un'amante dei borselli da uomo come me, e' stato bello vederne uno alle spalle di quasi ogni uomo. Il borsello, il piu' delle volte in pelle, era sempre di stile semplice e classico. L'altro accessorio molto usato dagli uomini era la sciarpa. Cerco sempre di convincere i miei amici maschlli, in America, ad indossarne una ma mi ridono dietro. Se solo sapessero che tocco maschile aggiungerebbero al loro look. L'uomo italiano che ama la moda, se ne intende davvero. E' super curato in ogni dettaglio, da capo a piedi. E, come direbbe mia madre, e' raffinato. The well dressed Italian man embraces accessories, whether it's the hat, scarf, lapel flower or eyeglasses. Experimenting is fun but it's never overdone. It's always just right. May I just say, thank God for the Italian man. In Italia, l'uomo ben vestito, ama i suoi accessori, sia che si tratti di un cappello, di una sciarpa, di un fiore all'occhiello, o di occhiali. Per loro sperimentare e' un divertimento ma non e' mai eccessivo. E' sempre la giusta dose. Lasciatemelo dire: Grazie a Dio per averci dato l'uomo italiano. Moore & Giles is an elite leather supplier based in Lynchburg, Virginia. 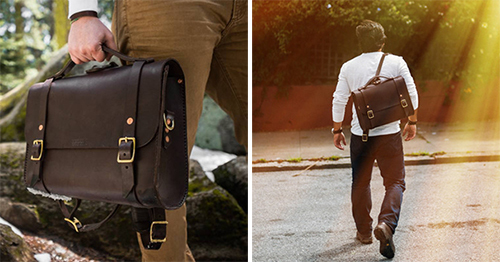 For well over 75 years, they have sold their ever evolving line of high quality goods, which now includes messenger bags, briefcases, totes, belts, wallets and tech accessories. 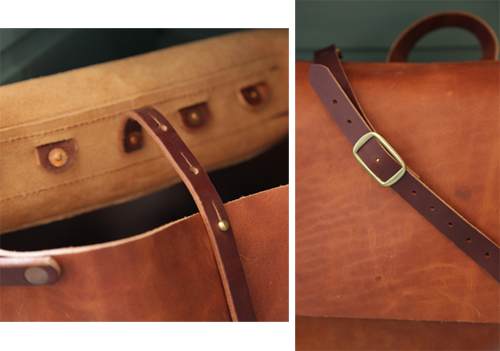 If a man wants to invest in one good leather item in their travel ware, a Dopp kit is a great place to start. And I like how Moore & Giles offer their version in a myriad of colors as it helps break up all that black and brown in a typical man's arsenal. I was happily surprised to see this leather work apron. It's a gift to last a guy a lifetime, as it will age beautifully with wear, tear and time. As stated on their site, "This vintage inspired leather apron not only pays tribute to the artisans and craftsmen of the past, but features a variety of well thought out details that make it functional for life today." Check out Moore & Giles to learn more...and happy Manly Monday.